Thinking about motorhome trips for couples – need some ideas? What could be more romantic than heading off in the UK, just the two of you in your motorhome? We are lucky in the UK to have some spectacular scenery and some romantic hidden spots which make the ideal getaway spot. Here’s our pick of the top 20 in all corners of Great Britain of motorhome trips for couples – the only problem will be deciding which one to visit first with your other half. First on our list of motorhome trips for couples is the Lake District. There couldn’t be a more romantic spot in the UK than the Lake District, where stunning scenery combines with pretty villages and cosy pubs offering a warm welcome and good food. Camping and motorhome sites are plentiful, but you’ll have to book ahead at peak periods. The Eskdale area, close to Scafell Pike and Wast Water is one of the nicest spots. Regularly voted the UK’s most romantic place but not known as being particularly camping friendly, the capital doesn’t have to be off limits for motorhome visitors. The Crystal Palace campsite is part of a large parkland area, and bus or underground will have you in the centre of the town in 40 minutes. The Atlantic coast of Cornwall is famous for its miles of sandy beaches, rugged landscape and interesting villages such as Tintagel and Boscastle. Motorhome visitors are well-catered for, but campsites can get very busy in summer months. As a special romantic treat, book a table in one of the many excellent restaurants in Padstow or Rock. Known as “Scotland in miniature”, Arran is less than an hour from Glasgow and is the perfect place for a holiday away from the hustle and bustle of city life with your other half. Catch a ferry from Ardrossan to the main town of Brodick, then drive the circular route around the island, stopping at one of the many campsites along the way. The olde worlde charm of the Cotswolds makes this area popular with summer and weekend visitors, but at other times of the year the area is much quieter. Use campsites at Chipping Norton or Stow on the Wold as your base, and explore the countryside and pretty Cotswold honey coloured stone villages. It’s as far south as you can go in the UK, and the Lizard is the destination for you if you like bracing seaside walks, hidden coves and some of the sunniest weather in England. Book in advance for the hugely popular campsite in the village of Lizard, very close to the beach. There are few cities with a castle right in the centre above the main shopping street, and Edinburgh attracts visitors from around the world to experience the medieval Old Town and Georgian New Town. Book into the Caravan Club site to the north of the city, on the shores of the Firth of Forth. Home to the man who wrote some of the most famous romantic plays in the English language, Stratford combines history, literature and is within easy reach of the Midlands and South East. There are a couple of campsites within easy reach of the town centre, but remember that these will get very popular during July and August. It’s the Scottish seaside town where Prince William met Kate Middleton as students of St Andrews University. What could be more romantic than visiting the town where a Prince met his Princess to be? This historic University town has lots to offer the weekend motorhome visitor. Enjoy a run along the West Sands, mooch around the quirky shops in the main shopping street and end the day with traditional fish and chips eaten in the open air. Romantic perfection and a perfect motorhome trip for couples. The Brecon Beacons national park in Wales is perfect for couples who enjoy an outdoorsy romantic break. Explore the Black Mountains, on foot, by bike or on horseback and then at the end of the day choose from a great range of pubs selling excellent food. Lying at the southern end of the Pennines, the Peak District has some beautiful walking trails in around the town of Bakewell. Chatsworth House is one of the UK’s finest and lies within the Peak District too. Visit in August when the heather is in bloom and the Peak District is looking its finest. Bath’s been a popular place for a holiday since Roman times, and the original Roman baths are still open to visitors today. Bath is a relatively compact city and is easy to get around, and there are several campsites within easy access of the city centre. Northern Ireland’s Causeway Coast is one of the most spectacular stretches of coastline in the UK. Take the walk down to the Causeway itself where you can see across to Scotland on a clear day, brave the narrow Carrick-A-Rede rope bridge, or just enjoy the beautiful beaches before rounding off the day with a pint in a traditional Irish bar. Skye’s accessibility from the mainland has made it one of Scotland’s most visited islands, and the size of the island means there’s plenty of space for everyone. Either reserve a spot in one of the campsites in Portree or Broadford, or indulge in a spot of wild camping, seeking the permission of the landowner first of course. West Bay is best known as the setting for ITV drama series Broadchurch, with its spectacular cliffs and pretty fishing harbour. It’s an area which is popular for tourists looking for a traditional British seaside holiday. There’s a large campsite and holiday park in the centre of the town, and several other options close by. York’s compact walled city centre makes it the ideal place for wandering around. Learn about the Vikings and later history, and browse in the interesting shops and cafes. 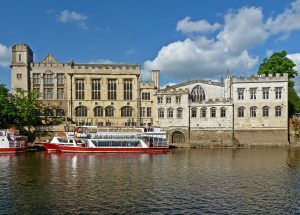 Don’t miss the recently re-opened Jorvik Viking centre, the York Minster and Betty’s, the city’s well known traditional tea room. There are lots of nearby campsites just outside the city’s ring road. Look into any park and ride services too for savings on parking costs in the city centre. One of the most unspoiled areas of the UK, the Northumberland Coast stretching north from Newcastle has miles of sandy beaches, castles at Alnwick or Bamburgh, and the opportunity to walk or drive over the causeway to Holy Island at low tide. There are numerous campsites and places to park your motorhome, but booking ahead is recommended. It’s one of the UK’s most popular city break destinations. Chester is well geared-up as a motorhome trip for couples looking for a romantic getaway. 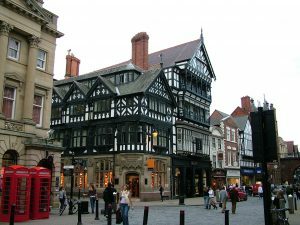 Enjoy a morning shopping in the covered arcades which are unique to the city centre, go boating on the Dee or visit the famous Chester zoo. There are several options for campsites and motorhome parking around the city, all in close proximity to the main atractions. Remember to look into any park and ride options too as there will likely be parking which will cost much less if you park just outside Chester and take a short bus ride into the city. You’ll also be able to avoid the one way system there and driving in the busy city centre. The south-west corner of Wales is relatively untouched as a tourist destination, so if you’d prefer to avoid the crowds this is the place for you. Choose from any number of deserted beaches for a romantic stroll, or visit Pembroke Castle if history is more your thing. Do your research online to find the ideal parking spot for your motorhome. You’ll likely find The Caravan and Camping Club have several listed in the area. 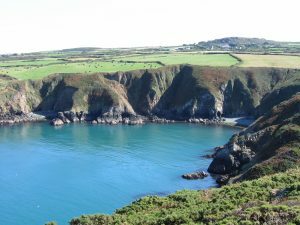 Bear in mind that the most popular sites may be booked months in advance as Pembrokeshire is not only popular for couples but also families holidaying. 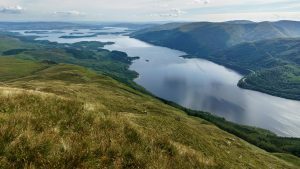 Less than 30 minutes from Glasgow city centre brings you to Loch Lomond, and this makes it a popular day out for city-dwellers. Stay behind after the day trippers have gone, and enjoy the mountain scenery or go boating on the Loch. There are lots of campsites along the side of the Loch, with the eastern side being more rugged and undeveloped than the western side. Don’t miss the pretty village of Luss which is a conservation village – the perfect place for afternoon tea as you enjoy the view.